← #WIN Kindle Paperwhite & Saturday Admission to #RomCon2015 Reader Weekend!! Finding himself fighting for his life after an ambush, Sheriff Josh Wellman awakens to find himself looking into the eyes of a real-life angel of mercy. When their hands touch, he knows his life has changed in that instant. But devastating heartbreak has left Mercy Smith’s faith in tatters, her heart guarded against more loss. Her dedication to the air evac trauma team she leads has insulated her from the realities of the earth below, so now Josh faces the biggest challenge of his life. 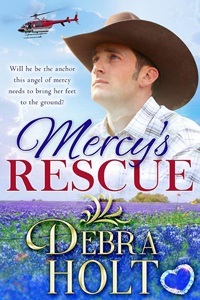 Can he find a way to get past the walls around Mercy and convince this angel to stay on the ground with him? Can Mercy open her heart to life again and find a way to restore her faith in God…as well as love? Mercy retrieved a cloth from the overhead compartment and gently tried to remove some of the blood and dirt splattered across the man’s forehead and cheeks—a strong-looking face. One of the paramedics had told them that this man had literally crawled and then dragged his fellow officer out of the line of fire before collapsing. Dark lashes appeared even darker as they lay against the ashen pallor of his skin. An equally vital mouth thinned into a harsh line of pain. The amount of blood still oozing through the bandaging concerned Mercy. The meds were not working as effectively as she would have liked. She looked down at him, and again his blue gaze locked on her face. Something stirred once more inside her, responding automatically on its own. Dragging her gaze away was harder this time. Darting a quick look outside the window, she could finally see a faint outline of the tall buildings that made up the hospital complex in the distance. Mercy felt his fingers stir, but he still didn’t break his grasp. She looked down again and gave him what she hoped was her best smile of reassurance. His eyes narrowed a bit. Was that a feeble attempt at a wink? This is one tough man. Mercy smiled in return. He’d better be tough for what’s ahead of him. The smile left her face as she and Paul made ready for the landing. Only when the skids of the helicopter touched the ground did his contact with her hand finally break. As she opened the door, Mercy experienced a strange, fleeting sense of loss. There was no time to dwell upon it. Several pairs of hands reached for the stretcher as she jumped out of the way. The ground medical team took charge of the patient. Mercy followed close beside the trauma physician, giving her report. The patient was centered in ER Three. The room was alive with movement that was both hurried and precise. Removing her helmet, she stood to the side of the activity. The patient’s booted feet hung off the gurney a bit. If she took a guess at his age, she would bet he was somewhere in his mid-thirties. She ventured a quick look but didn’t see a wedding ring. That meant nothing—many men didn’t wear rings. Her David would not have worn one either. He’d often said a ring would only get lost when he removed it to do surgery. The dark cloud of remembrance jolted her back to reality. Her job was done; she had passed her patient over to the trauma team. There was no need for her to stay. With a last look at the man currently the focus of everyone’s attention, Mercy stepped outside the room. Her steps faltered as she realized that she’d automatically sent a brief request on his behalf to whatever power the man might believe in; a request that the trauma specialists behind her would be able to use their combined expertise to keep him in this world for those who loved and needed him. Maybe he’d experience one of those elusive miracles. Debra’s real pride and joys, however, are her son, an aspiring film actor, and a daughter with aspirations to join the Federal Bureau of Investigation. (more story ideas!) When she isn’t busy writing about tall Texans and feisty heroines, she can be found cheering on her Texas Tech Red Raiders, or heading off on another cruise adventure. She read her first romance…Janet Dailey’s Fiesta San Antonio, over thirty years ago and became hooked on the genre. Writing contemporary western romances, is both her passion and dream come true, and she hopes her books will bring smiles…and sighs…to all who believe in happily-ever-after’s. Links to Debra’s website, blog, books, etc. Nicole Resciniti of The Seymour Agency represents Debra. Her first book, Under Texas Blue Skies, was published by Clean Reads. Her second book, His Country Bride, will be forthcoming from Spencer Hill/Tulip Romance. Mercy’s Rescue, her third book, will launch a new romance line, Bling!Romance, in August, for Lighthouse Publishing of the Carolinas. Debra invites you to visit her website at http://www.debraholtbooks.com/ She loves to hear from other aspiring authors or readers via email at debraholtbooks@gmail.com or follow her on twitter @debraholtbooks. Thanks, Debra, for sharing your story with us! Always a pleasure and thank you for sharing your space! The story sounds really interesting. Loved the excerpt. Thank you so much for having me on your blog today! I really appreciate the opportunity to share Mercy’s Rescue with everyone.